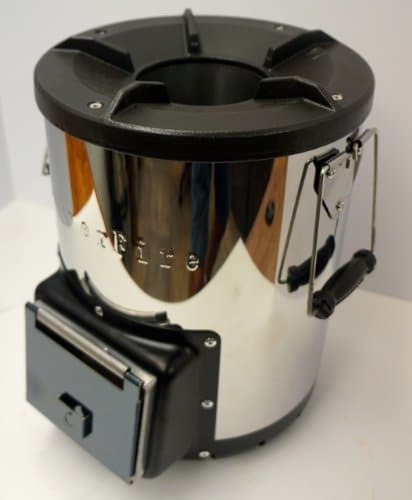 Introducing the SilverFire® Survivor 2nd Generation rocket stove! This state of the art clean cook stove is durable, fun, and fast. Our Survivor uses minimal fuel, produces little emissions or smoke. The advanced design is intended for improved efficiency and durability. Compare our superior quality to other brands of rocket stoves, and draw your own conclusions. Our SilverFire® Survivor rocket stove features our new solid stainless steel fuel shelf! 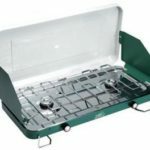 This state of the art clean cook stove is durable, fun, and fast. SilverFire combines more efficient secondary and primary combustion in our stoves. Our rocket stove is more efficient and use less fuel than other rocket stove designs. All other rocket stoves only offer primary combustion. Our new all stainless steel solid plate fuel shelf rides inside stove! Another SilverFire® rocket stove design 1st! No cheap painted steel wire rack to loose or misplace when you need it! Our correct rectangle shaped rocket stove combustion chamber allows the stainless steel shelf to ride inside the combustion chamber behind our custom black stainless steel door, when not in use. This is not possible by inferior round shaped combustion chambers found in most of our competitor’s stoves. The Stainless steel solid shelf has a tab that locks directly into combustion chamber floor and allows easy insertion of bio-fuels into combustion chamber, compared to poorly designed wire racks by StoveTec, EcoZoom and early EnviroFit stoves, which are easily identified by painted mild steel inferior quality stove bodies that all look the same with different paint jobs and have cheap clay tile floor titles that crack and fall apart. SilverFire use real ventilation ductwork for secondary combustion in the firebox floor, no cheap clay titles. Mild steel StoveTec, EcoZoom, & EnviroFit stove bodies are subject to short stove life. Our new stainless steel fuel rack insures greater safety by not allowing hot embers to fall through wire rack. Stainless steel is a superior choice in stove construction materials than mild steel. All rocket stoves can cook a hamburger or boil small pots of water. This is not an important cooking or emergency preparedness performance end point. 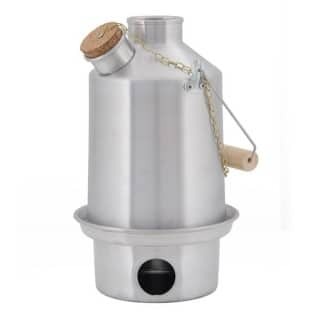 Providing a minimum of a gallon of emergency drinking water, or a pot of water to cook a meal (5 liters of water or more), or an adequate amount of water to sanitize your cookware is an important rocket stove comparison. The most important stove test to measure meaningful stove performance from one stove to another is the WBT (5 liter Water Boiling Test). Bringing a large volume of water to a boil with minimal fuel and just fine ash left as the end product is what distinguishes real stove performance. The SilverFire® Survivor ($179.95) is more than twice as fast boiling large volumes of water compared to the BioLite Basecamp fan stove ($299.95) for example, without the need to constantly remove spent embers due to less efficient combustion. Note just Survivor fine ash left and heavy char requiring constant removal on stove on right. Stove on right burned significantly less efficient. Heavy residue sign of inefficient combustion, more than doubling time to boil, time required cleaning, impeding heat transfer, and ventilation at twice the price of our SilverFire® Survivor! 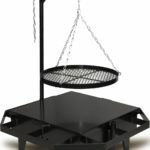 Hitzer Outdoor Fire and Barbeque Grill Shipping Included.